I took a slice of this to work for lunch, and when I was reheating it in the toaster oven, a colleague wanted to know what smelled so divine, so I gave her a piece of the galette to try. About three minutes later she stopped by my office door and said, "You should open a bakery." I made this galette twice. When I first made it, I fully caramelized the onions and then baked the galette. As a result, the onions turned pretty dark. They were totally delicious, but not necessarily photogenic. The second time I made the galette, I pulled some of the onions out of the pan and saved them to top the onions in the galette so that they could continue to darken in the oven. While the second method helps with the photos (you can compare the photos above with the dark onions in the photo below), I could not tell the difference in flavor. Another option for preventing the onions from getting too dark is to cut a foil circle and placing it over the onions when they are brown enough while baking. 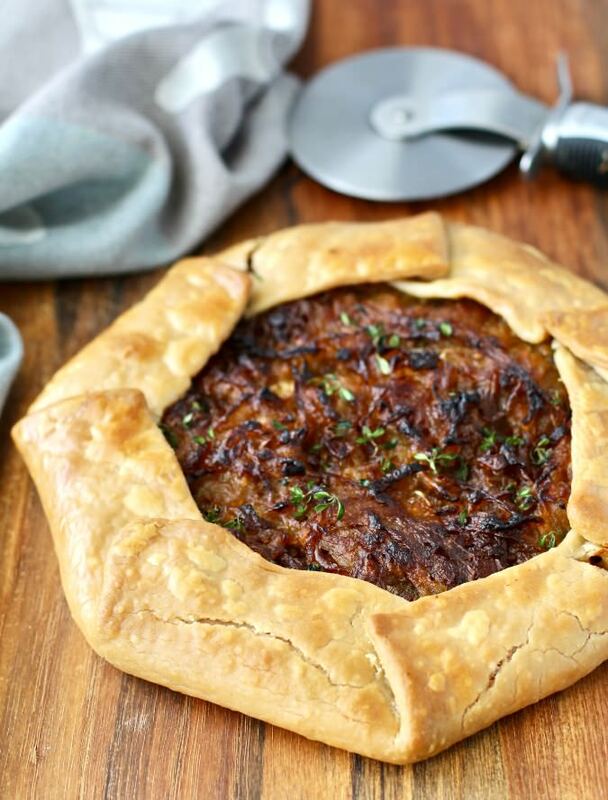 I'm not sure it's worth the effort, as this galette is so delicious, dark onions and all. You can roll out the dough for the crust in advance and freeze it for up to two months. For the onions, once you've caramelized them, cover them and refrigerate them for up to three days. You can also prepare the Parmesan and mascarpone mixture up to three days in advance. If company's coming, you can also put together the galette and refrigerate it a few hours before baking. For the crust, you can use your favorite pie crust recipe or a store-bought pie crust. Don't worry too much about shaping your galette. Part of the attraction of making galettes is that they are supposed to be rustic! I chose to bake with sweet onions. I've become a huge fan of onions. If I can get my hands on fresh spring onions, I'll buy as many as I can. Whenever Vidalia onions are available, I load up. In the meantime, I gravitate toward the onions marked as "sweet." Even if you can't find sweet onions, brown or yellow onions will work for this recipe. 2 1/2 pounds sweet onions, peeled, cut in half and thinly sliced. Melt the butter in a 12 inch skillet over medium heat. Add the onions and garlic and cook, stirring, for about 5 minutes. Add the sugar and thyme and reduce the heat to low. Continue to cook the onions over low heat, stirring regularly, until the onions are caramelized. This should take 40 minutes or longer. Let onions cool. If you're making the onions ahead, place them in a bowl, cover, and refrigerate. In a bowl, whisk together the mascarpone, milk, Parmesan, salt, and pepper. Cover the mixture and refrigerate until ready to use. Heat your oven to 400 degrees F with a rack in the center. Place the pastry dough on the parchment paper. Spread the Parmesan cream over the pie dough, leaving a 2 inch border. Cover with the caramelized onions. 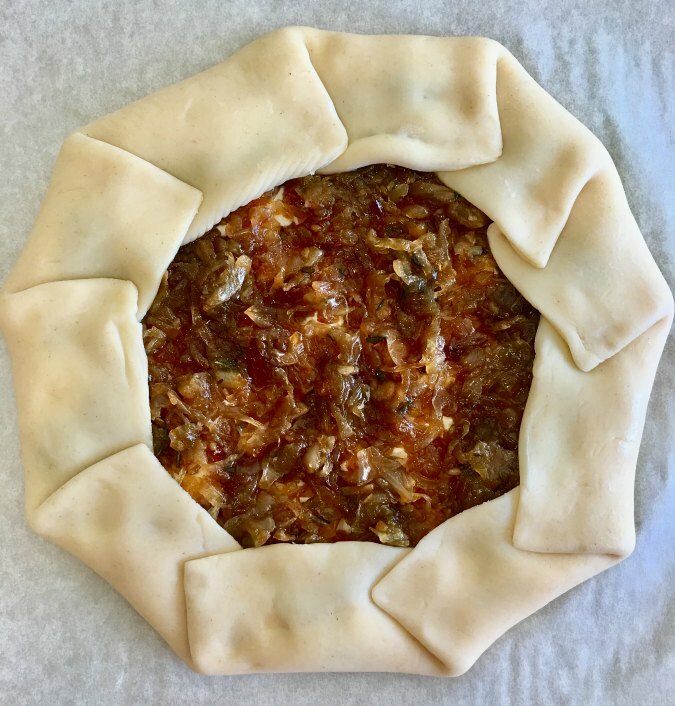 Fold the pie dough over the onions. 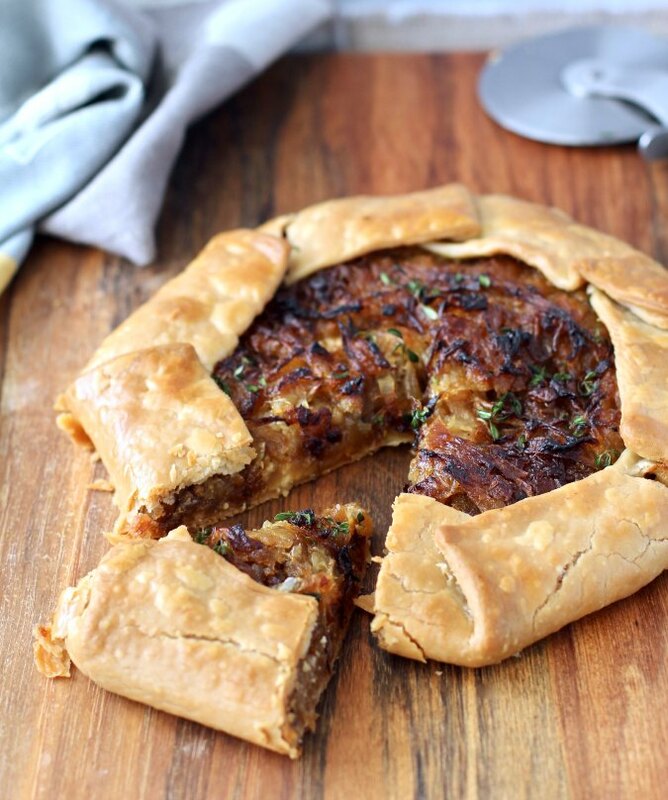 Bake the galette for 35 to 40 minutes, until the crust is golden brown and the onions are dark brown. Sprinkle with more thyme leaves at about the 30 minute mark. Let cool for about 10 minutes on the pan before slicing and serving. Wrap leftovers in foil and refrigerate. Reheat in the oven or toaster oven. Oh my...I am literally drooling right now. Must be time for breakfast LOL...wish I had a piece of this tart to dig into. I actually had some for breakfast! 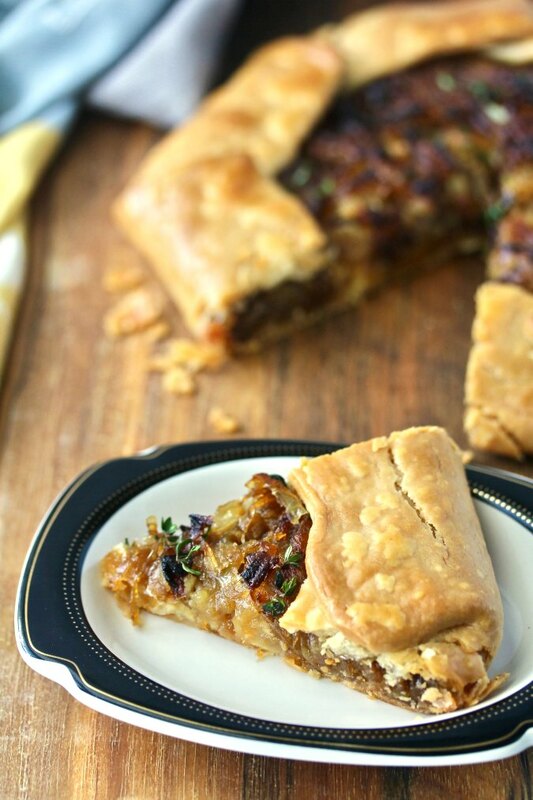 I love, love, love, caramelized onions,especially in a lovely tart like this. OMG. They are the best, right? Thanks! I've only made sweet galettes before, but this is right up my alley. My mouth is watering. Oh man! That looks amazing and I think I will br making it soon. I really love the onion and both cheese pairing, totally inspired! I have just been getting back in to galettes again recently and this sounds so my kind of flavors. Caramelized onions are highly underrated and that cream sounds perfect with them too. Caramelized onions may take some time, but they are so worth it. 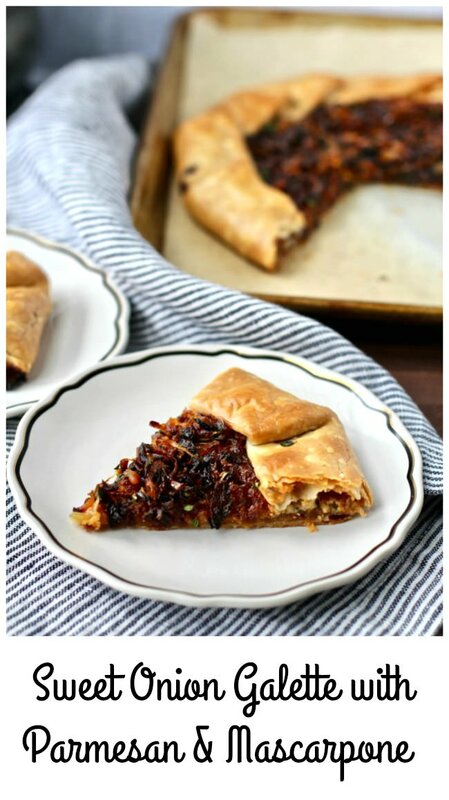 What a delicious combo of sweet caramelized onion and mascarpone, love the flakeness of the galette. I don’t mind darker onions. I think this would make a great pub appetizer to go with a pint of ale. Same here on the dark onions. What a great pairing!